Today, this united community, through the Walk Free Movement, focuses their voice and coordinates their actions to demand an end to the nightmare of modern slavery, amplifying the power of those organizations working tirelessly to secure change. We are seeking to continually strengthen and grow to achieve a world in which slavery is intolerable. Walkfree Bangalore is currently headed by Youth leader Bharath Aditya along with the Core committee Head (Karnataka) Vinay Karthik. The event consisted of a street play portraying Human Trafficking, Forced labour and Forced prostitution in India. The students of MEC Public School located in Yelahanka, Bangalore were made to realize how bad these social evils are and how to act upon such crimes happening in their environment. A PowerPoint presentation on The Walk Free Movement was given followed by an excellent speech on awareness by youth leader Bharath Aditya in the regional language, Kannada. The students were thoroughly impacted in the 40 min session undertaken by the BMSIT credential group MELANGE and few of them including the teachers joined our movement as well. The Walkfree Bangalore team congratulates the MELANGE group from BMSIT for a brilliant and powerful act that showed the students what is right without bearing any negative influence on them in the end. 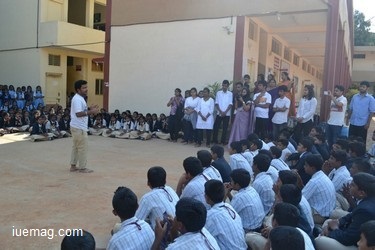 We would also love to thank Bharath Aditya for a powerful speech that everybody left with and also the Vice Principal of MEC Public School, Mrs. Padma V and Safety and Security Committee memeber, MEC Public school Mrs. Anitha Bhat for their support and involvement with our awareness program, resulting in a huge success.